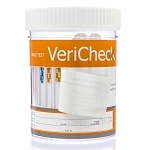 Urine Drug Test Cups are the easiest to use, on-site testing product available. 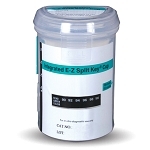 This self-contained urinalysis-screening device detects the presence of multiple drugs, alcohol or adulterants simultaneously. The device includes the reduced detection thresholds of Methamphetamine, Amphetamine, Cocaine and MDMA. Please keep in mind though that point-of-care testing devices cannot be used for DOT testing. Presumptive Positive:One colored line only is visible in each control zone. 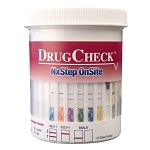 Negative:Two colored lines are visible in the control zone and in the appropriate test zone, indicating that concentration of the drug is below the detection limit of the test or not present. 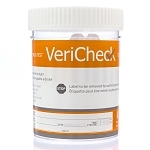 The test is available in 5 panel, 6 panel, 7 panel and10 panel quantities.